The snippet of coast with which we are concerned is in a permanent state of flux. The cliffs between Weybourne and their vanishing point at Happisburgh are constantly being eroded. Sandbars, banks and dunes that have been formed by the tides, gales and wave action over many months, can be ripped from their anchorages by one ferocious winter gale from the north-west. Stiffkey Freshes is somewhat lucky in this regard; the two-mile long Blakeney Point curves around offshore like a comforting arm affording some protection. This guardian prevents major erosion on the southern side of the channel; as a result the dunes edging the creek and abutting the beach have not changed a great deal over the years. I suggest that you time your visit for about one hour before low water. To reach the marram-topped dunes that are the picnic venue, you will need to take off your walking boots and paddle across the creek. To select a secluded and sheltered spot walk along the dividing line between the dunes and the ribbed hard sand that runs down to the channel several hundred yards away. Don’t be surprised if you put up a hare as you walk; they seem to favour living amongst the dunes. Once you have established your base take time to be still and look around you. Attune your ears to the constant calling of the seabirds and wildfowl that can be seen going about their business on the sands and in the shallows that lie in front of you. Take your binoculars and scan the north-west where you will see seals hauled out on the sandbanks. You may also spot a mussel fisherman wading up the creek, pulling his heavy boat behind him because the water is too shallow to run the outboard engine. It will be laden with the day’s catch to be shovelled into net bags on the bank of the creek. There are just a few places left in Norfolk that can be ascribed the adjective ‘wild’; Stiffkey Freshes is one of those. If you are an early bird and can get to the dunes as dawn breaks, or you are prepared to stay as dusk approaches, you will witness nature at its most impressive. These are the times of day that you will see a great deal of bird activity, with skeins of geese and flights of duck going to or returning from their feeding grounds. You may also see a fox hunting along the foreshore or a muntjak trotting along amongst the dunes. Do not visit only on hot summer days – wrap up warm and come in winter when the north westerlies blow and the clouds skitter across the sky like the sails of racing yachts. Watch the waters of the channel being whipped up and spume dancing off the crests of the waves. The fine sand that blows in drifts across the landscape will sting your face and you will taste salt on your lips; you may never feel as cold again anywhere else, but what a rewarding experience you will have had. Click on the pins for information. Points referred to can be plotted on OS Landranger sheets 132 and 133. 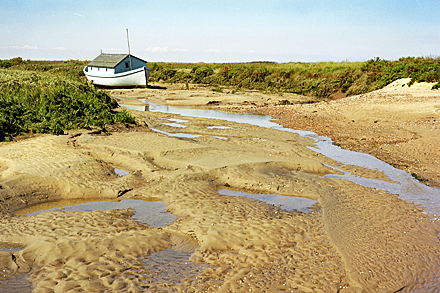 Stiffkey Freshes is located between Stiffkey and Morston adjacent to the Norfolk Coastal Path – MR TF990443. Coastal path car park at Stiffkey – MR TF963439. NT car park at Morston – MR TG005443. Access: The easiest way to reach the area is via the coastal path. Having parked your car at the National Trust car park at Stiffkey (no charge) walk east along the path for approximately one and a half miles until you reach the creek on your left. Alternatively, park on the NT car park at Morston (charge) and walk along the coast path towards Stiffkey – this is slightly further. When you have reached the Freshes you will see some moored fishing boats in the creek and dinghies hauled up onto the grass. There is an alternative and much shorter route from the A149 coast road at White Bridges – MR TF987436 – a location not named on the map. I should add a warning at this point. The A149 can be very busy in the summer months and is quite a dangerous road to walk along as there are no pavements or flat verges. For that reason I would advise against using this route if you have children with you. Carrying your belongings for about 200 yards on this road whilst supervising children is fraught with danger from passing traffic. In addition, the only parking available is in a layby on the north side of the road near two farm buildings. This layby is frequently used by bait diggers who make their way down to the marsh via the footpath beside the buildings. Do not go that way. Instead you need to walk down the road in the direction of Morston to the bridge over the River Stiffkey. Here you will find a marked footpath that will take you a short distance to the grass bank that runs alongside the coastal path. Climb the steps over the bank and turn right towards Morston.